What Is Your Favorite Catfish? Home › Forums › Fresh and Brackish Water Fishes › What Is Your Favorite Catfish? This topic contains 18 replies, has 12 voices, and was last updated by David Marshall 10 years, 4 months ago. Followed closely by Pseudomystus siamensis- The Siamese Bumblebee <#EMO_DIR# />/ohmy.gif” style=”vertical-align:middle” emoid=”:o” border=”0″ alt=”ohmy.gif” /> and even though I told him it was worth more than the $2.00 they were asking, they wouldnt listen! so I got a really cool catfish. He is nocturnal, but he comes out if half the tank lights are off and I put in something he likes to eat. Their color is like peanut butter and fudge stripes, they have long whiskers, become tame, stop growing at 6” and are very easy keepers. I’ve kept Clarias batrachus and found them to be a lot of fun. I may get another one, one day. I love RTC’s, TSN and Merondontotus tigrinus to look at. But I have real issues with the housing many aquarists use to keep them. Particularly RTC’s and TSN’s. Beautiful as they are, I don’t really think they should be in the hobby. Unless someone can provide a public aquaria sized tank or massive trop pond. As to the “Why” of why I like them. I’m not altogether sure – it could be that these were the first fish that I’d ever brought from a proper breeder and not from a shop. It could be their amazing colour, or it could be their behaviour. They’re always out and about (although not gregarious as they are spooked easy – this picture is pretty old I think because they’re not fans of the camera!). i like most cats,but if i close it down to individual species, cory concolors are my favourite. i also have a leopardus and a L72 that my wife christened Tank as it’s a female and huge for the species. 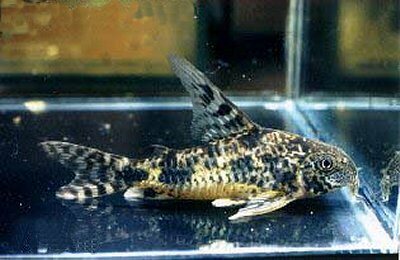 I think my all-time favourite catfish specimen (not species) is a Cory paleatus I had for about ten years. For the last year or two the decrepit bugger couldn’t be bothered to move except at feeding time! Our LFStore had some of these once and I almost bought some. the photo really doesnt do them justice…a very pretty fish!!! I love Marble Sailfin Plecos too..Prehistoric! Cory Guapore is stunning Matt but there is lots of stunning cory’s so I don’t really have a favourite as of yet. I like lots of cats but have only kept corydoras and ancistrus so picking a fave is impossible. I have stayed away from the larger or predatory species for the sake of my little fish. There is one I love and have though and just cannot seem to keep well. Love the cute little buggers, found 3 in a petstore once and never found any others. So they hid for months, finally lost two. Feeling bad for my one little one I bought 5 from Frank a few months ago. Big mistake….I should have bought 12. I’m finally figuring out that they just do not like life unless there is Lots of them. So now I have 4 left. tsk! I’m going to send them away to someone I know who has more, I want them to be happy. At a later time, when I’m not on the verge of tearing down tanks I’m going to buy a whole bunch of them and try again. They are so cute! Tiny little cats with tiny little whiskers. 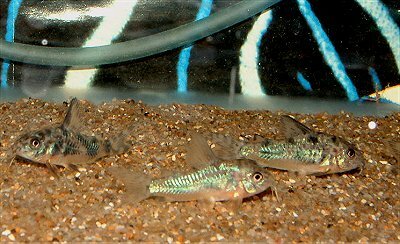 They also do more mid level swimming then corydoras, they remind me of hummingbirds. Dont blame you David! I have two synos, and I really like them too. Matt, that’s why I like the shark catfish, H.seemanni…they are always active in daylight and like midwater. KAH, that is definately the trouble with the cool big catfish..puts the kebosh on having anything small.